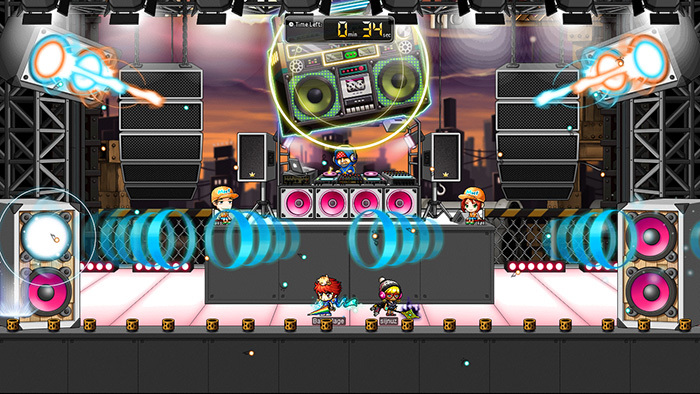 Maple Music Festival: October 24 – November 14 | Dexless, Maplestory Guides and More! Discussion in 'Maple Updates' started by Nexon, Oct 24, 2017. The Maple Music Festival is here—a celebration of music and friendship to brighten the spirits of Maple World! Players Lv. 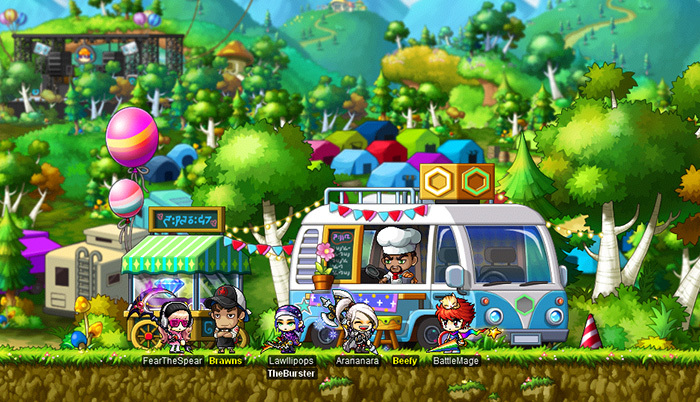 33 and above can join in on the fun by selecting the Maple Music Festival notifier from the left side of the screen. 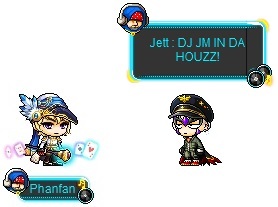 Henesys Stage: Groove along with DJ Pia! Good for beginning limbo players. Temple of Time Stage: DJ Pink Bean spins up a beat! Ariant Stage: Listen to the sound of the Sand Bandits! Kerning City Stage: DJ JM makes music happen! Sleepywood Stage: Dance away with the Lama Duo DJ Sleepy Brothers! This is one of the hardest stages for those with advanced limbo skills. If you’re ready to limbo, check the performance schedule by selecting the Maple Music Festival notifier from the left side of the screen. Mini-games are available every 5 minutes between 8:00 AM UTC and midnight (12:50 AM) UTC. You can join an active mini-game through the Maple Music Festival notifier. You can enter limbo mini-games six times per day. Once inside, you’ll join up with up to 20 other players and you have three minutes to duck and dodge obstacles while staying in time with the beat! Look out for oscillating sound waves, fire and other technical effects, speaker missiles, and falling equipment! The obstacles that appear and how they move across the screen depends on the music and the tempo. Depending on how long you last through the performance and how high a grade you receive, you will receive EXP and a trophy! Double-click your shiny new trophy to receive MMF Coins. The higher the grade you receive, the more MMF Coins you’ll get from your trophy. Certain scheduled performances will also have Fever Time! If you join a mini-game during its Fever Time, you can earn double the rewards when you complete it. MMF All-Star Chair: Untradeable. When approached, it will play random music from one of the five stages. When you’re tired, hang out with other players at the BBQ party to gain buffs. 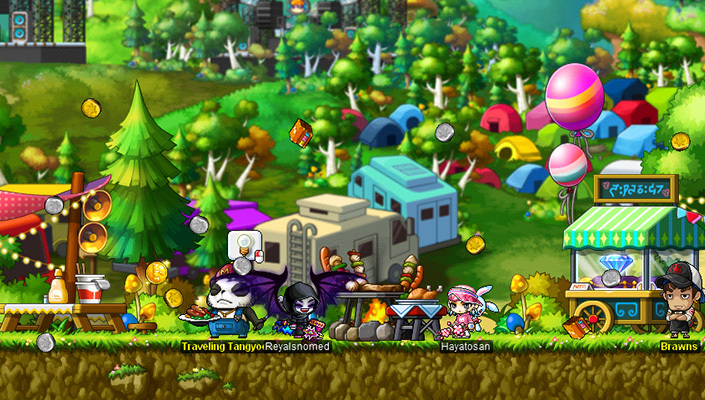 Head to the Camping Zone through the Maple Music Festival notifier. A good BBQ needs some ingredients, so hunt monsters within your level range (20 levels below and 20 levels above) to collect BBQ Party Firewood, BBQ Party Onion, BBQ Party Mushroom, BBQ Party Sausage, and BBQ Party Raw Meat items. As you find them, donate these items to NPC Traveling Tangyoon to cook on the grill, filling up the BBQ Party gauge. Once the gauge is full, the party can really get started as items including Silver Mesos, Gold Mesos, MMF Coins, and MMF Boxes rain down from the sky! Open your MMF Box to find a random item such as trait items, face paints, and restorative items. The Camping Zone becomes a special place on the weekend! On Saturdays during the event period, enjoy a 10-minute fireworks festival at 3:00 PM UTC and 8:00 PM UTC! If you hang around to enjoy the show, you’ll receive special 30-minute buffs. See different fireworks (and receive different buffs) each Saturday. Maple Music Groove: Buff that grants 2x EXP, increases Weapon ATT/Magic ATT +10, and increases Weapon DEF/Magic DEF +50for 30 minutes. 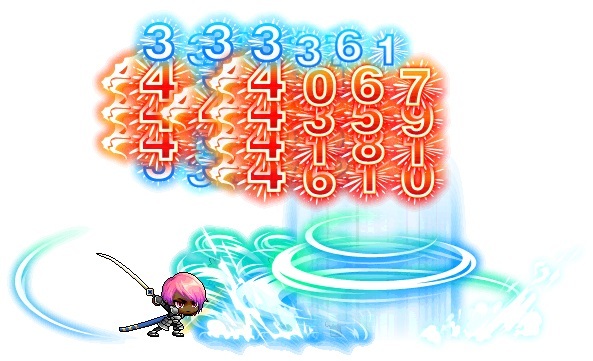 Maple Music Boogie: Buff that grants 2x EXP, increases STR/DEX/INT/LUK +10, and increases Weapon DEF/Magic DEF +50for 30 minutes. Maple Music Strut: Buff that grants 2x EXP, increases Weapon ATT/Magic ATT +10, increases STR/DEX/INT/LUK +10, and increases Weapon DEF/Magic DEF +50for 30 minutes. Stay logged in each Saturday and accept a quest that rewards you with a Fireworks Festival Celebratory Box. Open it to find items including a Master Craftsman's Cube Coupon, Mysterious Meso Pouch, Special Medal of Honor, Dragon Fireworks Damage Skin, Heart Sunglasses, and Flower Fireworks Hat. Heart Sunglasses: Req. Lv: 33, STR/DEX/INT/LUK + 2, Weapon ATT/Magic ATT +2, Weapon DEF/Magic DEF +20, Charm +100. 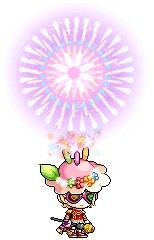 Flower Fireworks Hat: Req. Lv: 33, STR/DEX/INT/LUK + 8, Weapon DEF/Magic DEF +50. Make sure to collect MMF Coins throughout the event and take them to the Camping Zone to visit the Compound Truck Coin Shops there. 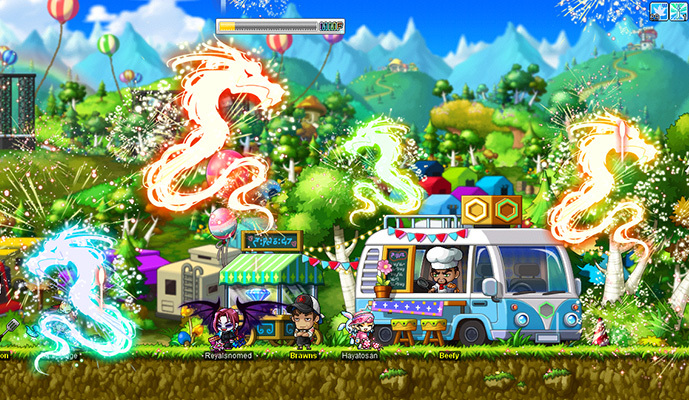 Each truck has stocked different items, and you can exchange your coins for fun items such as chairs, scrolls, buff items, and equips. MMF DJ Pia Chair: When approached, it will play the music from Henesys Stage. MMF Sand Bandits Chair: When approached, it will play the music from Ariant Stage. MMF DJ JM Chair: When approached, it will play the music from Kerning City Stage. 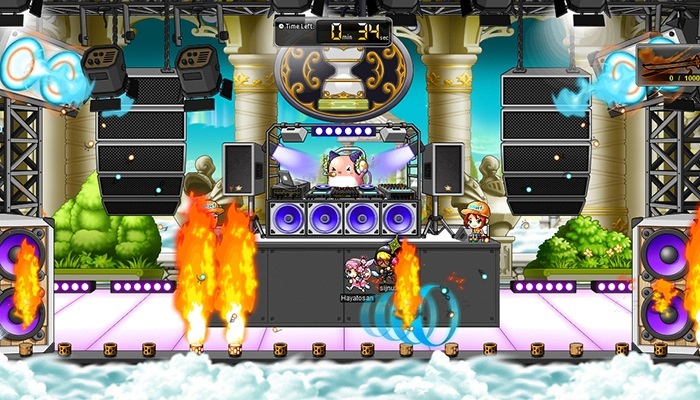 MMF DJ Pink Bean Chair: When approached, it will play the music from Temple of Time Stage. MMF Sleepy Brothers Chair: When approached, it will play the music from Sleepywood Stage.